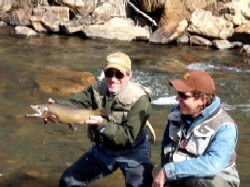 Where do guides prefer to fish on their day off?…Boxwood Gulch and Long Meadow. Larry and John from The Hatch Fly Shop with 11 of their fellow guides spent the day discussing business and doing a little fishing. I’m not going to tell you how many fish of this caliber were landed. One of the things we are proud of is the variety of species and the quality of our fish. The following is a small sample of some of our larger fish landed this winter. Of course, keep in mind that the really big ones do get away. It takes a long time to build a fishery of this quality. We have been at it for 21 years. I think these fish say it all.